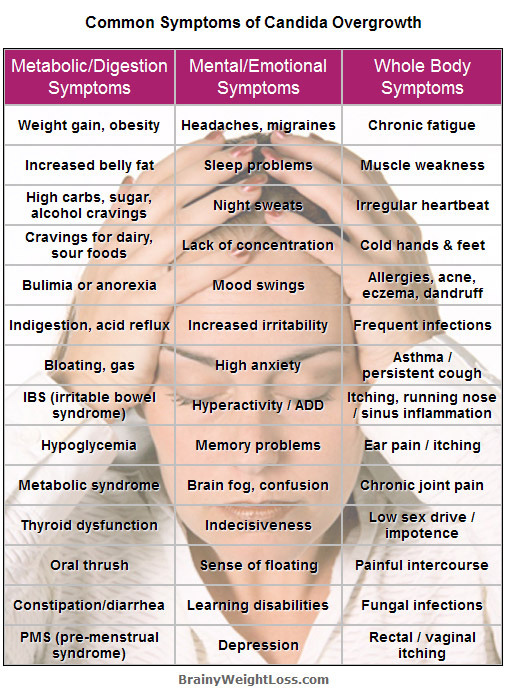 Are these 50+ Debilitating Symptoms Of Candida Overgrowth Making You Miserable and Unable to Lose Weight? Get your FREE E-course about the connection between the symptoms of Candida overgrowth (Candida Albicans symptoms) and your weight loss resistance – and what you need to do about it! With several ways in which the many symptoms of candida cause you to gain weight, you’ll find it impossible to get the pounds off – no matter how little you eat or how much you exercise – until you cure the root cause: the candida overgrowth. Read on to find out more! First, you should know that Candida Albicans is a type of yeast (fungus) usually present in the intestinal tract. …but when the Candida fungus spreads out of control upsetting the natural balance of your system, the intestinal Candida symptoms become not only visible, but very troubling – even crippling – if left untreated for too long. Believe it or not, the overgrowth of Candida (or Candidiasis) is responsible for a huge number of chronic health problems, which (sadly) are often misdiagnosed. Why? Because these symptoms are easily confused with other common disorders. Plus, most mainstream doctors are unaware of the severity and dangers of Candida Albicans symptoms. In fact, you could bounce around from one doctor to another for years not realizing that what you’re in fact suffering from is NOT a number of different health issues (sometimes contradictory), but a constellation of all-encompassing symptoms of Candida overgrowth. As you can see, many of these symptoms could be easily confused with a host of other chronic ailments. They are so varied and widespread that no one person has the same symptoms as another. But – if you are like most Candida sufferers – you may have as many as 20 or more debilitating symptoms like these. The Link Between the Symptoms of Candida Overgrowth and Your Weight Loss Resistance? A Candida overgrowth can easily spread to your blood stream, and from there to the other organs of your body. Once it spreads, it wreaks all kinds of havoc across all your body systems with its armory of over 75 different toxins, including ethanol and acetaldehyde. In fact, if you’ve gained weight and have difficulty in losing it – despite eating less and less and exercising – you may be among the 80% of the people suffering from a Candida Albicans overgrowth, as Donna Gates, author of “The Body Ecology Diet” suggests. What’s worse, is that you might also be among the great majority of people who aren’t even aware of it – that’s why it’s vital to know about these many symptoms of Candida Albicans overgrowth and how to deal with them intelligently. As you can imagine, a thorough Candida healing protocol is comprehensive and complex but outlines simple steps you must take to eliminate the root problem of your Candida Albicans symptoms.